Is execution of the overhead press, biceps curl, bent-over row and other exercises more effective in the seated or standing position? If you closely examine what is being promoted in many popular fitness magazines the answer seems to be the seated position. For example, for at least the past year I have seen only the seated version of the bent-over lateral arm exercise described. It appears that even the overhead press and biceps curl is gaining more supporters for the seated version rather than the standing version. In essence, there is considerable debate on seated vs standing exercises. 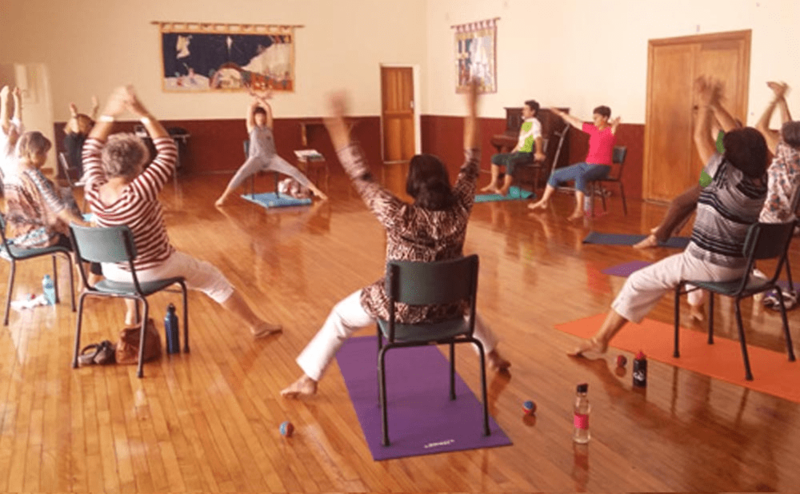 Some of the reasons given for preferring the seated version include that it does not allow for cheating, is more stable, is safer and makes the exercise more difficult. Close scrutiny of these reasons, however, may show that they are not valid. Many seated exercise may not be only more dangerous, but more ineffective than the standing version. In the seated position your body is more stable, mainly because your center of gravity is lower and you only have to balance the head and trunk. But, even though you are more stable, the seated position is more dangerous to the spine than the standing posture. In fact, according to many chiropractors, the seated position is probably the number one cause of back problems. The reason for this is that it is very difficult to maintain proper spinal posture while seated. Proper posture means that your spine is in maintained its normal, slightly arched position in the lumbar region. In effective standing or seated posture your trunk should be erect from the pelvis to the head. If your trunk is not erect and you instead have a rounded spine, the forces acting on the spine are compounded greatly. In time they can cause severe injury especially during repeated resistive movement. For example, handling weights with a rounded spine is a common cause of injury to the back. This happens most often when lifting weights off the floor or from a low height. Attaining and maintaining proper seated posture is much more difficult than assuming and holding proper standing posture. When you are seated you must contract the erector spinae muscles of the back to force you into proper posture and keep the muscles contracted to hold that position. However, most chairs are not made for you to sit upright. This is true of most chairs and especially couches and sofas. The soft seats automatically roll the pelvis under and create a rounded spine. Also, when you sit erect in a chair and you relax the erector spinae muscles, you will notice that the pelvis slides out and tilts backward so that you have a rounded back. Merely looking at a seated audience shows this quite clearly. You’ll see most of the people with the buttocks slid forward to the front of the seat, a rounded spine and the shoulders up against the mid- to upper part of the seat. Very few people will have their full spine flush against the back of the chair. In the standing position it is easier to hold the spine in good position not only by consciously thinking of contracting the erector spinae muscles, but by merely lifting the head and looking forward. This activates the “righting” reflex, which holds you in an erect position. Thus simple maneuvering of the head is usually sufficient for good standing posture rather than trying to constantly maintain a strong contraction of the lower back muscles, as is needed in many seated positions. Because of the rounded spine position when seated the forces acting on the anterior aspects of the discs are increased greatly. 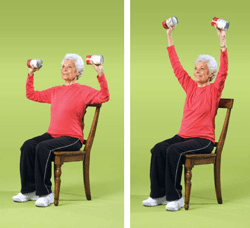 If you then do exercises in which you raise the arms up to the shoulders or overhead the compaction experienced on this small area of the discs increases even more so because of the weights as well as the upward movement of the weights. In the standing position, when your spine in its normal posture there is less compaction over a wider area, even when you lift weights overhead. The discs do become more compressed, but the compaction is spread out over the entire area of the disc so that it is more easily handled and absorbed rather than being concentrated in a small area. Because of this the standing position while exercising is safer for the spine. In addition, it is important to understand that when you are in a standing position your legs can act as a safety valve. If the weights are exceptionally heavy, you can absorb some of the forces with slight knee flexion and extension. In some case, you can even use the legs to give a slight assist to execute the exercise properly and effectively. Thus in the standing position, you have much greater control of the weights although maintaining balance may be somewhat more difficult than in a seated position. However, if you have been using free weights for some time there is little chance that you do not have sufficient balance capabilities to do the exercises correctly and safely. Also by doing additional exercises you develop sufficient strength of the extensor muscles which play the most important role in balance. It is important to understand that assuming the seated position because your balance is not as good as it should be, only creates a potentially more dangerous situation. More effective is to improve your balance rather than avoiding the necessity to balance. Balance can be improved quite easily by doing ankle, hip and spine extension exercises, as well as exercises for all the hip muscles. When these muscles are strong they can hold your upper body erect and in a stable position. It is relatively easy to practice balance by doing different exercises. This includes one leg stands with the trunk and free leg in different positions. In addition, doing exercises on one leg and in some cases doing exercises on both legs but with the eyes closed, can improve your balance capabilities greatly. 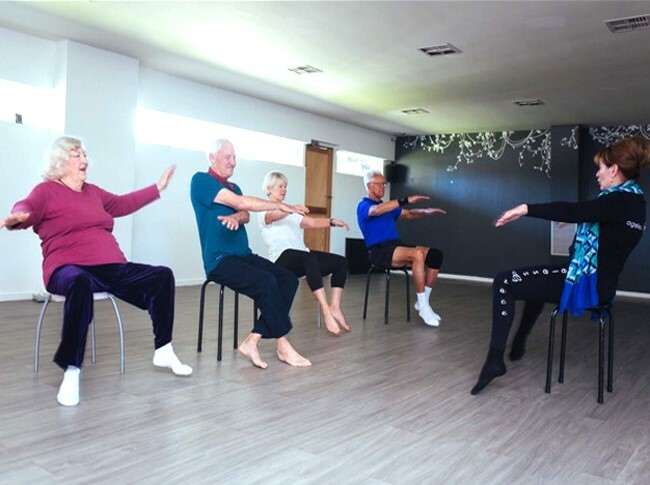 To illustrate how the standing posture is much more effective and safer than the seated posture it is necessary to look closely at some of the exercises that are being recommended for the seated position. For example, it has been stated that the biceps curl is more difficult in the seated position because you cannot use the hips to help get the weight started. However, using the hips in the standing position is not a wise recommendation. Individuals who push the hips do this only to handle greater amounts of weight; in essence, they cheat. Using the hips is not the normal way to do this exercise. It should also be noted that in the biceps curl exercise if you have a rounded back you place the arm in a disadvantageous position for effectively isolating the biceps. Since the biceps is a two-joint muscle it should be positioned so that the upper end of the muscle is placed on stretch. To do this you should hold the arm alongside or slightly behind the body to do the exercise most effectively. In the seated position this becomes impossible because of balance and posture. Thus, assuming a seated position to do curls, which can in time can injure the lower back, is a poor substitute for doing an exercise incorrectly. The seated overhead press is also very dangerous for some of the same reasons. When you are in a seated position with a rounded back and then press weights overhead the pressure on the spinal discs is multiplied several times. The exact amount will depend upon the weight that you are using and how rounded you maintain the spine. If you fully extend the arms directly over the head when doing the seated overhead press, you will feel the spine move into its natural slightly arched position. If you do the overhead press similar to a military press, i.e., with the elbows pointed forward, you will feel the arching of the lower back even stronger. The slightly arched position is of course, a very safe position of the spine when doing this exercise. However, when you return the weights to shoulder level and round the spine again as occurs in the seated position, it can create spinal problems. The constant switching from flexion to extension, together with the build-up of great disc pressure and compaction can lead to negative results. The seated bent-over lateral arm raise is perhaps the most dangerous of all exercises done in a seated position. When you bend over in a seated position to get the trunk somewhat horizontal, you must bend over from the waist which places the spine into maximum flexion. In fact, bending over in a seated position is an effective stretch for the lower back! Thus when you position yourself to do the seated bent-over lateral arm raise your lower back muscles become stretched and relaxed. Only the lower back ligaments support the spine. Contracting the abdominals in the seated position as is often recommended only compounds the problem. When you contract the abdominal muscles they pull the spine into greater flexion which is even more dangerous. Thus the initial positioning in the seated bent-over lateral raise is highly dangerous. To compound the problem when you begin raising the weights, especially in a very vigorous motion you will find the shoulders or chest rising somewhat because of the momentum. But with erector spinae muscles being relaxed they will be unable to control this movement and the spine will be moving in an uncoordinated manner with little control. Such movement is extremely dangerous. Note that the cause of most back problems in bodybuilding is improper spine positioning. Because of this, execution of this exercise takes number one position as an exercise that can contribute to lower back pain or other severe problems. For these reasons seated exercises are not recommended especially for healthy individuals. If, however, you have particular problems that prevent you from assuming a standing position and you must exercise in a seated position, you should take some precautionary measures to make sure your spine is in a safe position. One way of doing this is to straddle the bench and place your legs around the bench supports. Placing your feet around the sides of the bench helps to automatically place your spine into lordosis, i.e., the normal slightly arched position of the spine. If you are not capable of doing this then you should use a Tush Cush. 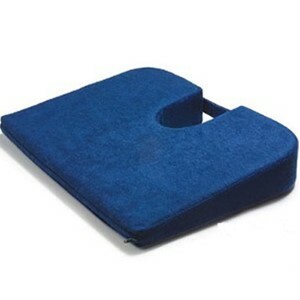 The Tush Cush is a wedge shaped pad with an opening into which the tail bone fits. When the tail bone is not compacted (as it is when it comes in contact with the bench), and the pelvis is tilted forward because of the angled wedge, it automatically places your spine into its normal safe position. Thus you can do some (but not all!) 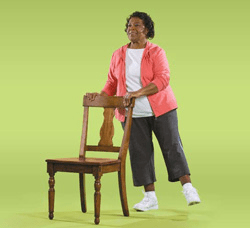 exercises while seated on the Tush Cush. In conclusion, do not be duped by many of the recommendations being advanced by various authors to do exercises in a seated position. The seated position is a highly dangerous position and should be avoided at all costs. Much safer and effective for isolating and developing the muscles involved is to use the standing position. This article by Dr. Yessis was first published in Muscle and Fitness in the 1980’s. Book your spot with us for the Anti-aging exercises training classes today!